Notes: Longest day of the year. The God is at his peak strength. Midpoint of the year. Light large bonfires after sundown. Peak of magickal power. Remember that nothing lasts forever. Celebrate abundance, fertility, virility, beauty, and the bounty of our earth. Good time for handfasting, workings for empowerment and consummation. 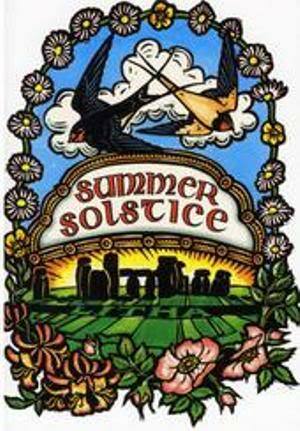 LITHA, (say Lee-Thuh) the Summer Solstice, represents the time of fulfillment. The God and Goddess ar wrapped in the ecstasy of their union. Midsummer is one of the significant turning points in the year. The sun is in the highest point in the heavens. However, there is also a change. Once the God has reached his zenith the dark begins to grow; the God begins to become introspective and to accept that his path leads to sacrifice and death. The Goddess must prepare herself for Cronehood. Nothing is certain but change and change is the basis of life. This is a time of celebration of the earth in full glory but it is also a time for the realization that change is inevitable and an anticipation of the harvest to come. Significant symbols are the making of Sun Wheel on a Solar Disk, bonfires as represented by candles, flower wreaths. Again, it must be remembered that the Celts reckoned their days from sundown to sundown, so the June 24 festivities actually begin on the previous sundown (our June 23). This was the date of Shakespeare’s A Midsummer Night’s Dream. Which brings up another point: our modern calendars are quite misguided in suggesting that ‘summer begins’ on the solstice. According to the old folk calendar, summerbegins on May Day and ends on Lammas (August 1), with the summer solstice, midway between the two, marking midsummer. This makes more logical sense than suggesting that summer begins on the day when the sun’s power begins to wane and the days grow shorter. Well, to begin with, their theological sensibilities may not have been as finely honed as our own. But secondly and more mportantly, St. John himself was often seen as a rather Pagan figure. He was, after all, called “the Oak King”. His connection to the wilderness (from whence “the voice cried out”) was often emphasized by the rustic nature of his shrines. Many statues show him as a horned figure (as is also the case with Moses). Christian iconographers mumble embarrassed explanations about “horns of light”, while modern Pagans giggle and happily refer to such statues as “Pan the Baptist”. And to clench matters, many depictions of John actually show him with the lower torso of a satyr, cloven hooves and all! Obviously, this kind of John the Baptist is more properly a Jack in the Green! Also obvious is that behind the medieval conception of St. John lies a distant, shadowy Pagan Deity, perhaps the archetypal Wild Man of the wood, whose face stares down at us through the foliate masks that adorn so much church architecture. Thus, medieval Pagans may have had fewer problems adapting than we might suppose.